The police collaborated in Italy, Belgium, Germany and the Netherlands on a case, since 2016. After two years of investigation, the police have now attacked the Italian mafia group Ndrangheta in four different countries, says BBC. The arrests of a total of 90 people occurred in the four countries Belgium, Italy, Germany and the Netherlands earlier today. The Mafia group Ndrangheta originates originally from Calabria in southern Italy but has expanded to have around 6000 members throughout Europe. In addition, they are estimated to account for 80 percent of Europe’s cocaine trade.The police seized three tonnes of cocaine and 140 kilos of ecstasy in connection with the search of Italian restaurants and icebergs in the four countries. These stores are believed to have been used to launder the drug bill for millions of euros, which were also seized in today’s action. Today’s police operation is called “Operation Pollino”, and it happened after two years of investigation of Eurojust – an organization that combats serious organized crime affecting more than one EU country. According to Morten Beiter, the Ndrangheta group is characterized by the fact that if they are pushed in one place, they move just another place. “It’s a huge organization that’s very hard to fight,” he says. However, it is a good thing that the European authorities have become more aware of how big a problem the mafa group has gone and been outside of Italy. As long as the whole part of the legal community makes available to this great criminal machine, arrests will be like hitting grass, and then you can go back there a week later and move the lawn again,” he says. In Germany, the police operation consisted of 240 police officers assisted by 240 federal police officers and the operation was concentrated in the German state of North Rhine-Westphalia, which borders Belgium and the Netherlands. In Holland, the mafa group is known to smuggle their drugs in flowers, which is one of the country’s largest industries. In Belgium, the action was concentrated in the Limburg area.According to author Morten Beiter, the Ndrangheta group was originally a bondemafia, which was not really taken seriously at the start. However, they suddenly grew incredibly fast, but because of their original reputation, they are still underestimated. “They have spread to most of Europe, and we even found out that they had activities in Denmark in connection with the construction of the light rail in Aarhus and a railroad in Zealand,” says Morten Beiter. Today’s arrests come in the wake of another police action on the Italian island of Sicily yesterday. Here, Settimo Mineo, the newly-crowned “godfather” of another mafia group, was arrested in Palermo on Tuesday with 49 other members on the island. According to the police, he has recently been chosen as the head of the entire Sicilian mafia group Cosa Nostre.However, according to Morten Beiter, the Ndrangheta mafiosos, arrested today, have nothing to do with the arrests in Sicily yesterday. According to the Italian prosecutor’s office, arrests in Sicily have been made to stop the return of the fearful “Cupola” group. The Cupola Group is a kind of leadership group consisting of leading members of Sicily’s Mafia groups, which make important decisions on criminal matters. 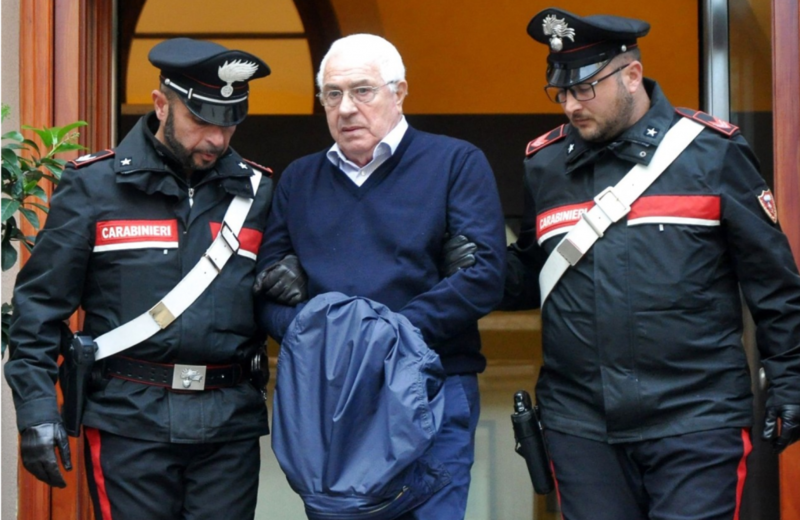 The Sicilian Mafiabosses have not met as part of the Cupola Network for 25 years since their former “goodfather” Salvatore “Totò” Riina was arrested in 1993. But after he died in prison last year, they met Sicilian Mafiabosses on May 29 this year, when Settimo Mineo was elected as his deputy.It’s not the first time that Mineo is arrested. He was arrested in 1984 and again in 2006 and has spent ten years in prison for mafia-related crimes.He has been tried to be murdered in a sack attack by a rival mafia group in 1982. The same year his brother was killed.